Ce condominium rénové avec goût, est une vraie maison loin de la maison. Il contient toutes les nécessités de ménage vous aurez besoin et plus encore. L'emplacement en bord de mer vous permet de se endormir et se réveiller aux sons des vagues. On peut prendre une photo de la lever sans sortir du lit. Ce est vraiment un emplacement privilégié sur l'île, puisque l'on peut passer les vacances ensemble sans laisser Bolongo Bay. Bolongo a trois des restaurants les plus populaires à Saint-Thomas: homard Grill, Iggies et Mims. Lobster Grill propose de la musique live et une ambiance romantique, Iggies a tout ce que vous pouvez manger jours et des soirées karaoké, et Mims (une famille détenue et exploitée authentique restaurant de fruits de mer des caraïbes) sert de loin le meilleur homard sur l'île. Bolongo Bay possède également son propre club de plongée, qui fournit une gamme complète de services, par exemple: plongée instruction / excursions, des excursions de plongée en apnée et la location d'équipement. En outre sur la plage, vous pouvez trouver location de jet ski et des excursions. En outre, il ya 2 sont court de tennis, trois piscines, un terrain de beach volley, et une petite grotte pour explorer à la pointe orientale de la baie. Il ya aussi un petit hôtel exploité de famille portant le nom de la baie, Bolongo Bay Beach Resort. Il est connu pour hosintg mariages somptueux sur la plage et de la planification des excursions en catamaran (bateau nommé: Jours célestes; amarré sur Bolongo Bay). Toutefois, si vous êtes intéressé à explorer le reste de l'île, vous êtes très proche de la plupart des points d'intérêt. (Voir la carte) En outre, il ya des ferries qui vous conduiront à d'autres des États-Unis et les îles Vierges britanniques à partir de Marina Bay Couronne et Red Hook Marina. Fer à repasser,, mobilier de jardin, chaises de plage, du savon, du papier toilette, de bain et serviettes de plage, de la literie planche; Balcon Meubles: 4 chaises, table, chaise longue, pack et le jeu. Great location! Photos true to what is presented. Wonderful ocean front condo, nicely furnished. Had on snafu with on a holiday that Steven texted right back and offered to correct the problem immediately. Would highly recommend, grounds are nice, pool and restaurants nearby were very good. Still appalled at the level of devastation by the hurricanes, the no see ums were bad at dusk in April. Had a great time and would definitely be back! We had a great time at the condo. Very comfortable and had all our needs met. The owners were very prompt in responding to e-mails and calls. My wife liked the convenience of having a washer/dryer, great views from the lanai. Thank you for your response. Glad that you like our condo and had great time. This was our first time in St Thomas. The rental place was priced very well. The Bolongo Beach/Bay was not our favorite but we had a rental car and spent our time on a couple beaches every day. We wanted to see/hear the water from the balcony and this place was great for that. The 2nd bedroom was a little warm since the air conditioner was not working (we didnt ask for repair assistance but it may be an issue for the next renters). The distance to everything on the island that we wanted to do was great!!! We spent two days on St Johns Island. We loved the beaches there also. We did goof and mix up the the car barge schedule with the passenger ferry schedule and had to leave our car on St Johns because we missed the last ferry to St Thomas. Dont make this mistake. We had to go back and retrieve the car on Sunday morning. We feel this place was great and got 5 stars for the value. There is no reason to not to rent here again. The host was very responsive during the rental process. I glad that you like my place and found everything you were looking for to relax during your stay and travel around the island. 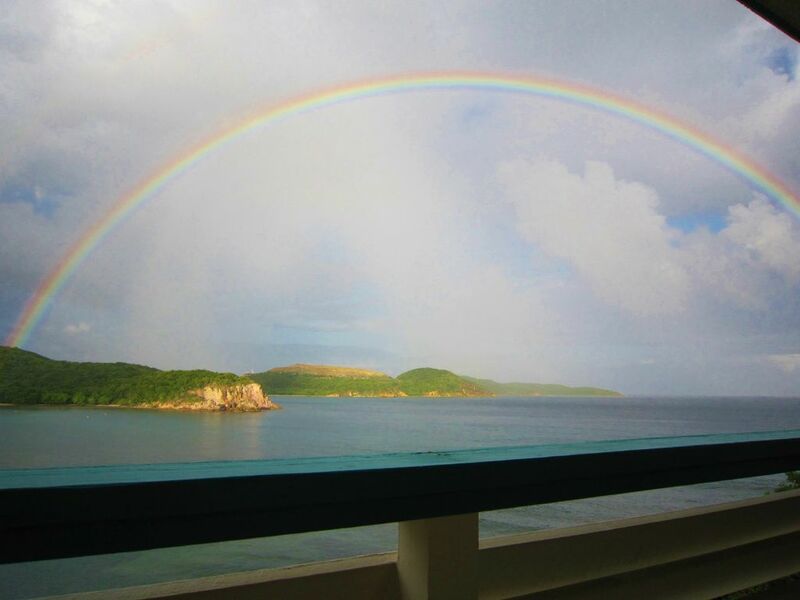 St.Thomas is a special place in Caribbean to spend time with the family and friends. The a/c in the bedroom will be checked and replace if necessary. Thank you for choosing my condo. Our family of 4 stayed here over Xmas break. It was a perfect location for exploring the island. Its not apparent to vistors new to the island, but you can pretty much drive to many corners and beaches within 20 minutes. There's lots more to do, but during our week, we visited Mountaintop to try out the original Banana Daiquari while catching the views and doing some souvener shopping (there's a massive store up top with a huge selection - probably one of the best places to get sourveners); went snorkeling with St. Thomas Diving Club HQ'd on Bolongo Bay; booked two hiking/kayaking/snorkeling trips with Virgin Islands Ecotours (we highly recommend them!) both on St. Thomas and on St. John; rode the Red Hook ferry over to St. John for a daytrip (ferry tickets can be bought up to 10 days in advance and nearby Red Hook is easy to get to and worth checking out in advance for its restaurants, supermarket, shops); enjoyed a historical food walking tour with Gerard of St. Thomas Food Tours; ate at Glady's Cafe twice (highly recommended!) in Charlotte Amalie (13 minutes by car); spent an afternoon at Lindquist Beach (this is for folks who want a beautiful beach while avoiding the cruise ship crowd at Megan's Bay). We didn't get a chance to ferry over to any of the BVIs, but Jost Van Dyke and Virgin Gorda are two to keep in mind. The condo is about a 20 min. drive from the airport and easy to find. We used the iPhone's Maps app for navigation during the whole trip and just pinned the condo location before we left home and didn't need the written instructions provided. The condo is located on the 2nd floor up a very short flight of stairs. The very large veranda has a gorgeous view of Bolongo Bay. During evenings, you'll want to spend some nights just chilling out on the patio chairs with your favorite beverage. The condo itself was perfect for our family of four. There are two bathrooms with showers plus washer/dryers. The kitchen is ample for cooking and has a large modern refrigerator, dishwasher, sink, and range/stovetop. Cabinets contained flatware, plates, pots/pans, utensils. Wifi in the condo is good. For our visit, Mim's and Iggie's were two local restaurans on Bolongo Bay that re-opened after the hurricanes. Mim's, about a 2 minute walk, specializes in Carribbean lobster and seafood. Iggie's has reopened as a large poolside popup at the Bolongo Bay resort. Food Center, a fully stocked supermarket, is about 3 miles away and a good resource. Enjoy! The condo is implacable! No hurricane damage! The condo has an excellent location. It is warmed by the sun rays in the morning and has shade and relaxing breeze the rest of the day. It was so pleasant we did not need to use air conditioning.The condo has everything one needs for a great vacation: comfortable bedding, fully staffed kitchen and most important electricity. It is right by the pool and the sea. Water in the sea was very pleasantly warm. Good number of restaurants was open close by. We can not wait to come back! Bolongo Bay, South Side, îles Vierges américaines - Saint- Thomas, des Caraïbes - Ce est vraiment l'emplacement privilégié sur l'île, puisque l'on peut passer les vacances ensemble sans laisser Bolongo Bay. Bolongo a trois des restaurants les plus populaires à Saint-Thomas: homard Grill, Iggies et MIM. caractéristiques Grill de homard de la musique live et une ambiance romantique, Iggies a tout ce que vous pouvez manger jours et des soirées karaoké / musique live et de Mim sert de loin la meilleure nourriture sur l'île. Bolongo Bay possède également son propre club de plongée, qui fournit une gamme complète de services de l'enseignement de la plongée à la location de matériel et diverses excursions en catamaran. En outre, il ya un court de tennis, trois piscines, plongée en apnée, et une petite grotte pour explorer à la pointe orientale de la baie. Il ya aussi un Jet Ski location / excursions stand sur la plage. Bolongo héberge plusieurs mariages, à cause de cela paysage pittoresque.